Lurnin' with Dave | Do not panic! Do not panic! Do not panic! Do not panic! Unless you’ve been hiding under a really large rock recently, you are no doubt aware of a horrible scourge threatening the safety and well-being of every man, woman, and child in America. But Chris Brown is currently on probation so we should be ok for a while. However, there is ANOTHER scourge the news media cannot stop talking about: Ebola. What is Ebola? Well, technically it is a river in western Africa that is probably a little P.O.’d about how it’s name has been used. It is also the colloquial name for a terrifying, wormy-looking virus that has a fatality rate of 50-90% (slightly higher than Chris Brown). This hemorrhagic virus is particularly terrifying due to the graphic symptoms one experiences as the disease progresses. Symptoms such as bruising, vomiting, and bleeding from orifices. I would like to take this opportunity to provide a concise summary of my extensive research using scientific articles about the virus. 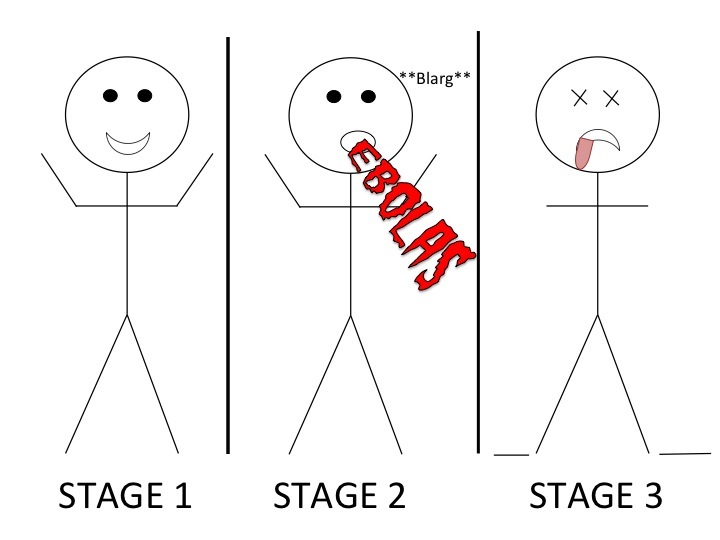 The following graphic summarizes the stages of the virus in an Ebola victim (note that the victim is contagious in Stages 2 and 3). If there is any good news regarding this virus, it is regarding transmission. 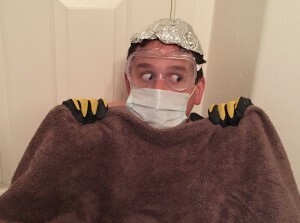 Ebola is only passed on when the blood, sweat, tears, vomit, urine, doody (or other body fluid) from an infected person makes contact with another person’s insidey parts through a cut or the mucous membranes (which should be covered with underwear anyways as we live in a decent society). It currently cannot be transmitted through the air…unless blood, sweat, tears, vomit, urine, or doody is thrown in the air I guess. So while it is seemingly difficult to transmit Ebola on a large scale, the virus is now in America. Currently, 0.00000000333333% of Americans have/had the virus!! That is nearly 1 in every 300 million people!! 1. Do not panic! This is the most important step. You cannot rationally think and evaluate the multitude of potential scenarios that result in you dying a slow, bloody, agonizing death if you are panicking. I myself am a quintessential example of someone who doesn’t know what quintessential means. I am also an example of clear, calm and rational thought. Here I am today, exhibiting the peaceful aura you will need to demonstrate for your loved ones. 2. Stock up on essentials. In the event of an outbreak of Ebola in your area, you will want to have food and water supplies on hand to remain home for a while. You won’t need to go crazy though. Just get enough to survive for 8 years without the input of outside society. 3. Don’t lick the vomit of infected people. You may say: “this is America David! You can’t tell me whose vomit not to lick.” That is true, keep in mind these are just recommendations. 4. Watch your surroundings. As 1 in every 300 million Americans is a festering carrier of Ebola, don’t go anywhere where there are Americans. So, in conclusion: you are welcome. Also, where is the nearest ledge from which to jump from? No Replies to "Do not panic! Do not panic!"